Scientists have reversed paralysis in dogs after injecting them with cells grown from the lining of their nose. The pets had all suffered spinal injuries which prevented them from using their back legs. The Cambridge University team is cautiously optimistic the technique could eventually have a role in the treatment of human patients. The study is the first to test the transplant in “real-life” injuries rather than laboratory animals. The only part of the body where nerve fibres continue to grow in adults is the olfactory system. Found in the at the back of the nasal cavity, olfactory ensheathing cells (OEC) surround the receptor neurons that both enable us to smell and convey these signals to the brain. The nerve cells need constant replacement which is promoted by the OECs. For decades scientists have thought OECs might be useful in spinal cord repair. Initial trials using OECs in humans have suggested the procedure is safe. In the study, funded by the Medical Research Council and published in Brain, the dogs had olfactory ensheathing cells from the lining of their nose removed. These were grown and expanded for several weeks in the laboratory. The researchers say the transplanted cells regenerated nerve fibres across the damaged region of the spinal cord. This enabled the dogs to regain the use of their back legs and coordinate movement with their front limbs. The new nerve connections did not occur over the long distances required to connect the brain to the spinal cord. The MRC scientists say in humans this would be vital for spinal injury patients who had lost sexual function and bowel and bladder control. BBC News – Nose cell transplant enables paralysed dogs to walk. Treatment should help alleviate aches and pains for “Red,” a 12-year-old black Labrador retriever. A decade ago, “Red,” a black Labrador search and rescue dog, was deployed in the 9/11 attacks at the Pentagon in Arlington. Many of the hundreds of search and rescue dogs sent to the Pentagon, World Trade Center in New York City and Shanksville, Pa., have since passed away. On Monday, Red, who is now 12 years old, received a breakthrough stem cell regenerative treatment from Dr. John Herrity, D.V.M., at the Burke Animal Clinic to help ease crippling arthritis and live out her days in greater comfort. Red was sent to the Pentagon on Sept. 16, 2001, with her owner and handler, Heather Roche of Annapolis, Md. They worked at the site for 11 days, finding remains of victims in the Pentagon’s north parking-lot area. Red later helped in the aftermath of Hurricanes Katrina and Rita. No longer able to handle tasks like climbing a two-story ladder, Red retired in July 2011. “She still wants to work, but her body just can’t do it anymore,” Roche said. The two-part procedure takes a little over an hour and normally costs $2,000 to $2,400. Two other 9/11 dogs that recently received the same stem cell therapy are able to run, climb and play again. The treatment mainly helps larger breed dogs ages 9 and older with hip and arthritis problems. Herrity has experience with more than two-dozen stem cell operations. MediVet-America, which developed the in-clinic stem cell technology, donated the cost of the procedure and cryogenic banking of additional stem cells. Veterinarians and researchers describe stem cell regenerative therapy as a major scientific development in the treatment of arthritis, hip dysplasia, ligament and cartilage injuries and other degenerative joint diseases in dogs, cats, horses and other animals. The technology uses an adult animals’ own stem cells to heal itself. MediVet-America’s treatment involves removing fat tissue from the animal, separating the stem cells from the fat, activating and injecting the cells into the affected areas. Within four to six weeks, animals who were in severe pain with a restricted range of motion are able to walk, run and even jump again. Key to the procedure is an advanced, patented L.E.D. technology that activates millions of dormant stem cells present in fat tissue. MediVet donated the test kit system for Red’s procedure on Monday. Two other Sept. 11 search and rescue dogs also have been treated with stem cell therapy and are doing well, according to MediVet. Bailey, a 15 year-old black Lab, underwent the procedure in November. Hoke, a 14 year-old yellow Lab, was treated in December. Both are doing well, according to their handlers, and have resumed normal activity in retirement. Search and Rescue Dog in 9/11 Attacks Receives Stem Cell Treatment in Burke – Lorton, VA Patch. DAMN! SILENCE OF THE LAMBS MEETS STEM CELLS! SILENCE OF THE LAMBS MEETS STEM CELLS and future transplant recipients win big!! Remember in Silence of the Lambs, at the end of the movie, when Hannibal Lecter cuts off the guards face and then wears it out to escape? It turns out, if he had some stem cells to go with that face transplant, he could have just kept on wearing it. Newswise — SAN FRANCISCO: Surgical researchers at the University of Washington, Seattle, have pioneered a method using stem cells that may one day eliminate the need for antirejection drugs in transplants. Primary investigator David Mathes, MD, FACS, and his research fellow Jeff Chang, MD, MS, presented their findings today at the 2011 Clinical Congress of the American College Surgeons. Two groups of patients who might one day benefit from this early research breakthrough are hand and face transplant recipients. To date, survival of these transplants has depended on administering high-dose drugs to patients that suppress the immune system like those used in major organ transplants. However, these drugs are expensive and have a multitude of side effects, the researchers explained. The surgeons performed simultaneous transplants of vascularized composite allografts—transplanted tissue with the blood vessels intact—and stem cells in four dogs followed by a short course of immune-suppressing drugs. All four dogs accepted the grafts without complications. After about a month, the researchers discontinued all immune system suppressing drugs. One dog rejected its stem cell transplant 10 weeks after the operation, but continued to tolerate the composite allograft for over one year without immunosuppression. The other three dogs tolerated both stem cells and composite allografts for over one year. The investigators also performed vascularized composite allograft transplants without the stem cells on three other dogs. All three rejected the transplants after immune-suppressing drugs were stopped. “If this technique works and proceeds into a clinical model, we would be able to transplant patients with either face or hands or even solid organs without the need for long-term immunosuppression drugs,” according to Dr. Chang. Physicians prescribe these drugs to people who have undergone hand and face transplants because organ transplant recipients, such as those receiving a liver or kidney, must take high-dose drugs to suppress the immune system and stave off organ rejection. Innovators of the hand and face transplants have followed this protocol to similarly prevent tissue rejection. However, the side effects of these drugs have been widely reported. Kidney transplant recipients, for example, have a heightened risk of developing diabetes and hypertension. These drugs also raise the likelihood of infections and malignancy in all transplant recipients, Dr. Chang explained. Moveover, the American Society of Transplant Surgeons has estimated that immune-suppressing drugs can cost up to $25,000 a year per person. While solid organ transplants are considered life-prolonging procedures in which the benefits outweigh the drug side effects, Dr. Chang noted that hand and face transplants do not fit this category. “Face and hand transplants are not life-saving procedures, so not subjecting these patients to the risks of immunosuppression would certainly be beneficial to them,” Dr. Chang said. Although this research is still in an early phase, an important new finding the University of Washington study unveiled is the role that stem cells play in making the body tolerant of transplanted tissue, Dr. Chang said. “It’s interesting that you can modulate the immune system in such a way that you can transplant other cells into the recipient and the recipient becomes tolerant of them,” he said. The study involved vascularized composite allograft transplants matched to the recipient’s tissue type. The next step is to attempt transplants in what Dr. Chang called a “mismatched” setting—where the donor and recipient tissue types do not necessarily match. “If we can get this to work in a mismatched setting it would be more clinically relevant,” Dr. Chang said. Dr. Mathes and his collaborators at the Fred Hutchinson Cancer Research Center are attempting to develop this experimental model into a more clinical model for humans. The use of a canine model for this research is significant because large animals more closely resemble human anatomy and physiology with regard to composite allograft transplants, whereas “trying this method in small animals, such as laboratory mice, would be more difficult to translate into humans,” Dr. Chang explained. David Mathes, MD, FACS, is the primary investigator for this project. Jeff Chang, MD, MS, is his research fellow. Both collaborated with Rainer Storb, MD, at the Fred Hutchinson Cancer Research Center in Seattle. Surgeons Develop Simultaneous Tissue and Stem Cell Transplant Technique. By Michelle Stoffel TribLocal reporter Feb. 15 at 8:00 a.m. Things were getting bad for Doodle. Despite her youthful name, the 9-year-old German Shepherd was experiencing joint pain from bilateral hip dysplasia and osteoarthritis. She would get sore and tired from long weekend walks and started falling up the stairs. Her owners, the Dahl family of Oak Brook, had tried different options before landing on animal stem cell regenerative therapy, a procedure that’s a hot topic in the veterinary world. Last week, Doodle received reportedly the first such one-day operation in Illinois at the Veterinary Specialty Center in Buffalo Grove. The practice of using stem cells, derived from the animal’s fat, to treat joint problems could be discouraging for pet owners because of cost and timing. The animal used to have to go twice to a vet hospital: once for surgery to remove fat cells and once again for the injection of the stem cells into the inflamed joint. The cost was around $2,700. Leslie Dahl, Doodle’s owner and a veterinarian herself, didn’t want to go that route. She had tried anti-inflammatory medication, but Doodle’s stomach couldn’t handle it. She tried collagen injections, but they didn’t fully relieve Doodle of her pain. Plus, the animal already was difficult at the vet’s and she was concerned that Doodle would get too anxious between the visits. So when the Veterinary Specialty Center started looking into a new procedure that allows the stem cells to be processed in the same facility on the same day for about $1,900, Dahl was intrigued. The process is essentially the same. Fat is removed and then processed by being put in a centrifuge and spun until the stoma stem cells are separated. They are then isolated, activated and injected back into the animal. In the clinic before a lab was established, the cells were shipped to California, said Mitch Robbins, a surgeon at the Veterinary Specialty Center. The pet would be under anesthesia for removal of the cells, then a second time for the re-injection. 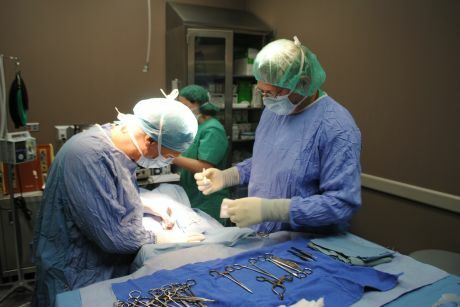 Doodle’s operation, and that of another dog called Fergus, were the center’s firsts in which the stem cells were processed in house, Robbins said. He said he’s seen about 70 to 80 percent of the animals improve significantly with the treatment that’ s been available since about 2005. Research is progressing on the treatment’s effectiveness, May said. Robbins said success depends on the animal’s ailments. Pets that don’t respond may be experiencing pain from a source other than inflammation of the tissues around the joint. “Some dogs do better, some do worse, some don’t respond at all,” he said. On average, the animals he treats get re-injected every 18 months, he said. The cells can be stored, with subsequent procedures costing about $600. Robbins believes the one-day procedure and lower cost will encourage more pet owners to help out their older dogs with arthritis or inflammatory problems. Dahl said her family would have had to euthanize Doodle if pain prevented her from moving, but that would have been a really tough decision since they embrace the dog’s quirky personality. So far, Doodle’s recovery has been going well. It takes about 10 days to heal from the initial surgery and about four to five weeks to see results. Doodle is still throwing balls to herself and performing stuffed animal tricks, but is not quite back to going up and down stairs. “I don’t expect this is going to be a magic bullet to give her back her youth,” Dahl said. “But to get her where she’s not falling and she’s not in pain after going for just a moderate walk, that’s quality of life. Stem cell therapy goes to the dogs — Buffalo Grove news, photos and events — TribLocal.com. Technology is giving us many new inventions daily. One such recent invention of world class manufacturing technology has been made by Medivet Pty Ltd. The Research and Development Division of the company has introduced a new procedure with the help of which, the veterinarians can extract, process and activate an animal’s own adult stem cells by injecting them back again into the animal’s own body. Medivet has recently introduced this unique procedure. Several countries worldwide and many international veterinarians today are using this procedure to treat many degenerative diseases such as primary and secondary arthritis, hip dysplasia, damaged or torn ligaments and tendons, joint pain, worn or damaged cartilage etc. Medivet has spent many years and millions of dollars to introduce this one of the most exciting and valuable treatments ever released, exclusively for the veterinary field. The company is really making big with its American division, Medivet America LLC that is leading the field in sales and Adipose Stem Cell procedures. Trials are still being conducted at many universities, in Australia and internationally. Also, thousands of Adipose Stem Cell Kits have been supplied to veterinarians enabling them to perform Stem cell procedures including the 14 international countries to which, Medivet is currently exporting the kits. Stem Cell Technology Treating Many Degenerative Diseases Today | TopNews United States. A Tauranga company is offering veterinary clinics a process for stem-cell treatment that improves healing and brightens – even lengthens – the lives of dogs, cats and horses. The groundbreaking treatment is being applied to osteoarthritis, and ligament and tendon injuries affecting racehorses. Stemvet New Zealand, established in September 2009, is committed to providing veterinarians with the knowledge and products to make stem-cell therapy an everyday treatment. It also wants to put New Zealand veterinarians at the forefront of developments in regenerative medicine. “The treatment certainly relieves pain and slows the ageing process,” said Stemvet co-owner Gil Sinclair. Dr Sinclair, a veterinarian who has four in-vitro fertilisation (IVF) laboratories in New Zealand and Australia, has been involved with animal reproduction for nearly 30 years. He has recently worked with researchers in Sydney on the development of stem-cell extraction technology and its application in veterinary clinics. His enthusiastic business partner, Kerry Hitchcock, talks about a dog suffering from osteoarthritis that was “a doormat at home”. 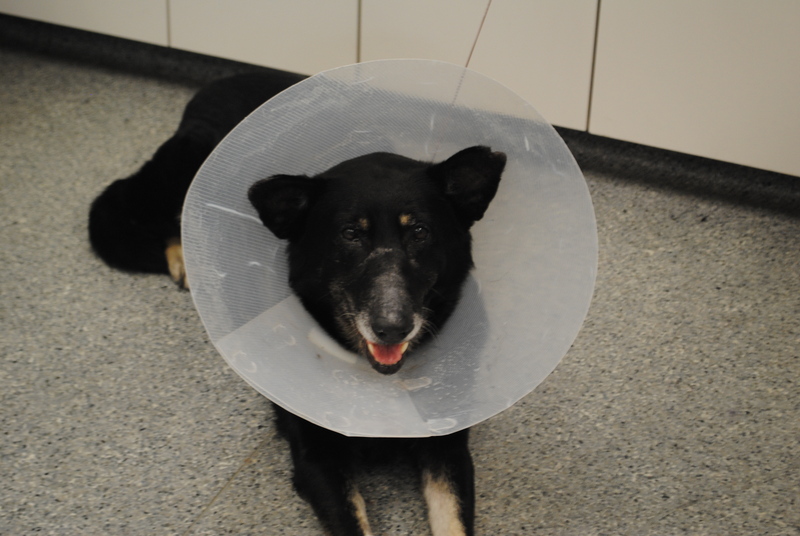 The dog had an intravenous dose of stem cells and its condition improved. In a short time it was bouncing around. Mr Hitchcock said an inquisitive neighbour asked the dog’s owner what had happened to the dog. “The neighbour was amazed in the change to the dog,” said Mr Hitchcock. Early cases treated so far have been dogs – between 8 and 14 years – severely affected with osteoarthritis, and young racehorses that have suffered tendon injuries or have osteoarthritis. Fat tissue containing dormant adult stem cells is taken from the rump of horses and from under the skin of dogs, and from other animals behind their ribs. Each gram of fat can contain anything from 4.5 million to 28 million stem cells. The fat is digested in a water bath at 37C, then spun in a centrifuge, and the stem cells filtered out. A platelet concentrate – containing natural stem-cell activators – is extracted from a blood sample. The platelet and other solutions are mixed with the “fat-extracted” stem-cell concentrate to activate the stem cells. The mixture is then exposed to a photobiostimulator which provides extra activation. The whole process takes three and a half hours. The now active adult stem cells are reintroduced to the same animal, mostly by direct injection into the affected joints or tissues. Some are administered intravenously and find their way through the blood system to the inflamed area. Stemvet has become the exclusive New Zealand distributor for Australian-based MediVet stem-cell therapy products and equipment, which includes the water bath, centrifuge, photobiostimulator and extraction kit. The package, including equipment and kit, costs $15,000 and in the past month six veterinary clinics, in Christchurch, Blenheim, Wellington, Tauranga, Hamilton and Auckland, have signed up. Stemvet provides training, free of charge. Pet owners are charged about $2500 for the treatment – cheaper than the $4000 quoted by an overseas competitor. A Palos Hills vet leaned on a colleague for an innovative treatment for her own dog. As a veterinarian, Leslie Dahl knows the obstacles that aging pets can face. And as a pet owner, she has watched her own dog battle the stairs with arthritic hips. But if all goes as planned, her dog will soon be walking pain-free. Doodle, a German shepherd, became a guinea pig, so to speak, as the first animal in Illinois to undergo a one-day, in-clinic stem cell procedure. Dr. Mitch Robbins conducted the procedure on Friday at Buffalo Grove’s Veterinary Specialty Center, where he removed fat tissue from Doodle’s abdominal area and used the center’s newest technology to inject the dog’s hip joints with her own stem cells. While the Buffalo Grove clinic has performed about 40 such regenerative therapy procedures over the past four years, until now the extracted materials were shipped off-site for preparation, resulting in a more drawn out and expensive process. Last week, Veterinary Specialty Center adopted new technology from Kentucky-based MediVet-America, which allows medical professionals to complete the entire process in-house over the course of just a few hours. Katherine Wilkie, MediVet-America’s lab services director, guided Buffalo Grove’s team through the process, which involves using machinery to separate stem cells from the rest of the animal’s tissue and cleaning it so that it can be re-injected. While professionals received instruction, Doodle, still groggy from the tissue extraction, waited in a nearby cage. By the end of the day, she was picked up by Dahl, who brought her back to their Oak Park home. Over the next few weeks, she is expected to regain her mobility, which has been hindered by bilateral hip dysplasia and osteoarthritis. Robbins emphasized that stem cell treatment will not cure arthritis,but in most cases the procedure eases his four-legged patients’ discomfort. He said the treatment has benefited about 75 percent of his patients, and two-thirds have no longer needed pain medication. That is especially important to pet owners like Dahl, whose German shepherd’s sensitive stomach won’t tolerate more traditional treatments. Last spring, she brought Doodle to Veterinary Specialty Center for collagen gel injections that noticeably improved the dog’s condition. When Doodle’s discomfort returned in recent months and Dahl learned that the treatment was no longer available, she jumped at the chance to test out the stem cell process. “We’re going to do what we can to make sure she’s with us as long as possible,” Dahl said. Robbins said stem cell therapy is generally effective for about 18 months. Extra cells are collected during the initial extraction and stored for subsequent injections, he said. “They are never going to cure the arthritis, but they should do a very good job of controlling the pain that Doodle has, allowing her to resume a better, more normal quality of life,” he said. MediVet-America’s technology was introduced in the U.S. May 2010, and it is now being used in 23 states, Wilkie said, with one or two procedures taking place in the U.S. each day. Doctors report success rates ranging from 75 percent to 90 percent, Wilkie said. The procedure costs about $1,800; nearly $1,000 less than the expense of a multiple-day procedure, which involves the costs of sending the tissue to outside labs. Robbins said he expects to use the new technology to benefit 20 to 50 dogs and cats per year.